He and Liara had my back. But I didn't throw the shooting contest on the Citadel - he's a big boy. 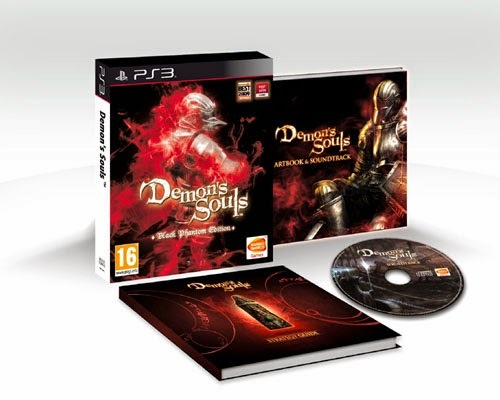 Demon's Souls is a game that developed a cult following before release in Australia which meant that I read a lot about the game before coming to experience it. I got hold of a second hand copy (of the rather nice Australian Black Phantom Edition) back in 2010 and somehow it took me nearly 2 years to fire it up. Despite this I still felt excitement as it loaded for the first time, knowing I'd finally see what all the fuss was about. I'd assumed that the servers would now be offline but discovered they are still online and the ongoing interest in the game means there are no plans to take them offline for some time yet. This was great to hear as the game provides unique mechanisms to interact with other players throughout despite being an ostensibly single player experience. Items carried at the time of death are retained and remain with you upon re-spawn. Any physical interaction with the level itself is also retained as part of the game state. This means that any time a door is unlocked or path is opened this will remain so from there in. This is important, and feeds directly into the level design which effectively provides mini-level path branches that can be tacked individually and provide much quicker access to previous areas and hence opportunities to return to your bloodstain and regain lost souls. Losing souls is a setback in experience but otherwise doesn't matter. The true focus of the game is gaining experience in the traditional sense of the word. The experience lost in souls is offset by the 'real' experience gained by the player through the practice of defeating enemies and learning the level layout. In other words - the game dares to demand that you practice at playing it in order to achieve a certain level of skill required to progress. Player skill. In the high score, practice makes perfect sense. Experience systems. In the 'play for long enough and you can grind up enough levels to get your way through anything' sense. 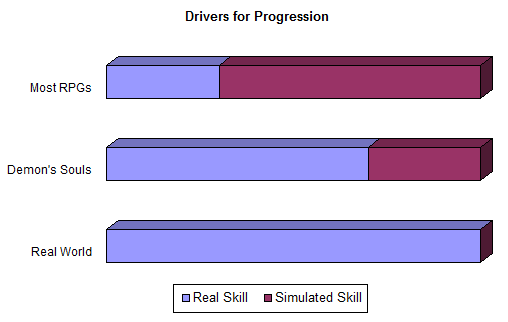 It's worth noting that the second of these drivers (generally) doesn't exist in the real world. Take a driving test. You can't simply repeat a driving test until you've clocked up enough hours to receive an automatic pass. A pass is only awarded if you actually execute the test with sufficient skill to satisfy the examiner's minimum standard. Contrast this with most RPG battle encounters. Enemies are ranked in experience just as the player is, and though an enemy of higher levels can be beaten through skillful execution of the mechanics victory can also be achieved by simply gaining an experience ranking (level) that is sufficiently higher than the enemy that victory is assured regardless of how skillfully the player executes the battle. Demon's Souls is somewhere in between. Player skill is emphasized but there is still an underlying RPG experience/leveling mechanic. Your ability to rely on this mechanism and progress through simulated skill alone (grind) is however significantly penalised. A shortfall in execution skill brings about swift player death and with it the loss of any accumulated experience points. The designers have tuned this progression balance so that it becomes essentially impractical to progress without demonstrating a minimum level of execution skill. Having managed to complete levels 1-1, 2-1 (and some of 4-1) I've barely scratched the surface of this game and am unsure of what lies ahead. I suspect this translates to a learner's permit and I'm in for a shock when I hit the open road. 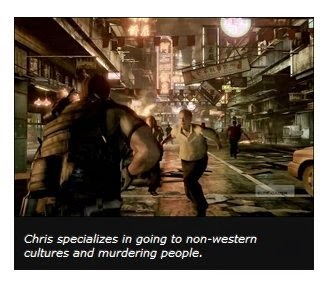 Eurogamer really captures the spirit of long time Resident Evil protagonist Chris Redfield with this caption.